Using your computer, a slideshow and OBS Studio, you can now broadcast a webinar on Facebook live! A couple weeks ago, I had the opportunity to go live in a Facebook group. It was a great opportunity to get in front of a new audience and share my expertise. But up until recently Facebook live streams could only be a person live on video. And while it’s great to see someone speaking, I love a good set of slides and the webinar concept. Until last month Facebook Live was limited to mobile devices. Now desktop/laptop users can also stream live video content to Facebook. You can now go live from your laptop and share your screen just like a more traditional webinar. How awesome is that?! Want to learn how to look like a pro when going live on Facebook? Keep reading! OBS Studio is a free and open source software for video recording and live streaming. It’s definitely got a learning curve but once you figure it out, it’s pretty easy to use. I’ll go over the basics of using OBS in a video below. Powerpoint provides the most professional look as you can present in a smaller window than full screen and without any Powerpoint graphics getting in the way. Google slides has a newish feature that allows you to present without being in full screen – using a browser window. This works, but I’d suggest opening the presentation in a new Chrome window so when you go to present your viewers don’t get distracted by any other browser tabs you may have open. The other downfall to using Google Slides is that there is a visible pop up menu that sits in the lower left corner of the slides. The graphic goes away after a bit, until you accidentally place your cursor over the browser window, then it comes back. This could be somewhat annoying but by remembering not to move your mouse over the window while you present you’ll avoid it’s return. Unfortunately, you can’t use Keynote for this as the only way to present your slides is in full screen. And full screen presentations are a problem when you’re trying to use OBS Studio. The good news is that if you already have a Keynote presentation you can export it to Powerpoint or open it with Google Slides so any previous work is not lost. Since you’ll have OBS and a slide presentation open on your computer, it’s easier to have your smartphone or tablet open to the facebook live session so you can easily monitor any questions or comments you’d like to address. The mic on your headphones or laptop will also work but stepping up to a USB mic helps to make you sound more professional while cutting out background noise. These two mic options by Blue are always on Top 10 Mic lists. The Snowball is a steal and it’s more sophisticated sibling the Yeti will have you sounding like a pro. Of course you can use the webcam on your computer but if you’re looking to up your game, this webcam is a perennial favorite. How do you use OBS Studio? The biggest hurdle to get through to present slides on Facebook live is learning OBS. So I created a video tutorial on how to use the software. We'll walk through a simple webinar scenario where there is live video and a slideshow. (OBS is a really powerful tool that's capable of a lot more than I'm showing here.) Ready? Great, let’s go! You can watch the video just below for the full details or scroll down to read an overview of the steps. Download and install the free OBS Studio here. GENERAL: I left most everything here at it’s default except that I also want to record the Facebook live streaming so I checked “Automatically record when streaming”. That way I have a backup of the recording in case for some reason I can’t download the recording from Facebook. STREAM: Here you will select Facebook Live for the Service and copy/paste your Facebook Live Stream Key. Here are instructions from Facebook to get your Facebook Live Streaming Key. You will want to wait until you’re close to starting the live stream to copy and paste the key into OBS – the keys are time sensitive so if you do it too early it may no longer be valid when you try to go live. AUDIO: This is important! If you don’t select an audio device, your audience will not be able to hear you. If you’re using your desktop/laptop’s built in mic, be sure to select Built-in Microphone from the first Desktop Audio Device or if you’re using a USB mic or headphones mic, select Built-in Microphone from Mic/Auxiliary Audio Device. You can also select the Channel – either stereo or mono, depending on your equipment. HOTKEYS: These are great but you have to be able to remember them in order for them to work. Try a post it note on your device with your hotkeys list. These are shortcuts for starting/stopping the stream and switching between scenes. Think of a Scene as a screen and a Source as what will play on the screen. For a basic webinar set up there would be two scenes: the slideshow and the video feed showing the presenter. 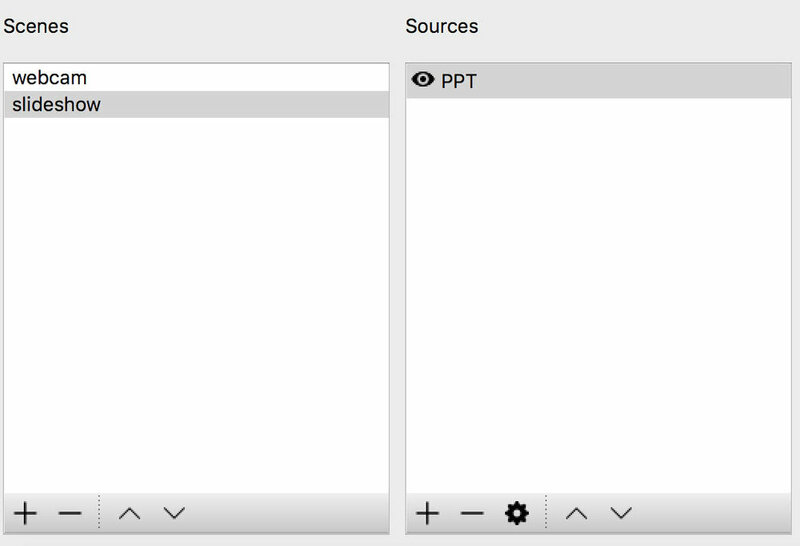 The Sources are the actual programs or devices that appear on the screen/Scene. For the slideshow, it would either be Powerpoint or Google Slides and for the video of the presenter it would be a webcam. For the scenes, either right click within the white box under Scenes and select Add or click on the plus sign at the bottom left of the white box. Enter the name of your scene and click OK. I named my scenes Webcam and Slideshow. Once you’ve created your Scenes, you need to tell OBS what program to use to play the Scene. We’ll do this by either right clicking on the white box under Sources and select Add or click on the plus sign at the bottom left of the white box. The Add pop up menu will appear and you can select your Source type (either video capture device for live video or window capture for a slideshow) and then give it a name. You'll then get a pop up menu that will ask you to define the source's window where you will select Powerpoint if you're using a Powerpoint slideshow or Facetime HD Camera (if you're on a mac, otherwise whatever your webcam is called is what you will select) for video. And that takes care of the OBS set up, next up is starting the Facebook Live stream. Once you’ve gotten your settings input, setup your Scenes and Sources, you’re ready to stream live. 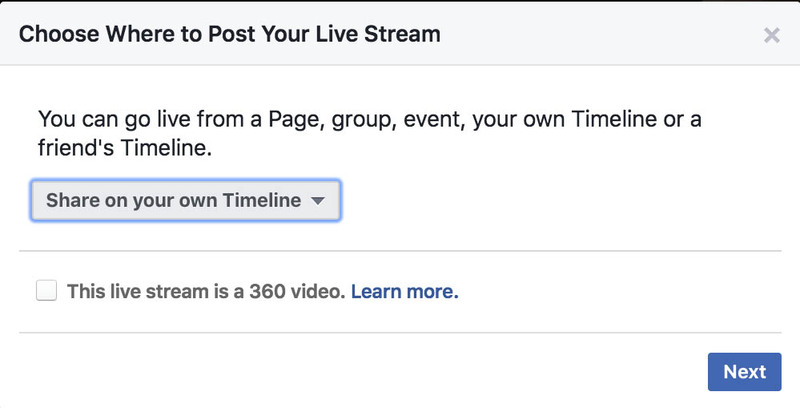 Now is when you’ll want to head back over to Facebook to copy your stream key and get your Facebook live session started. 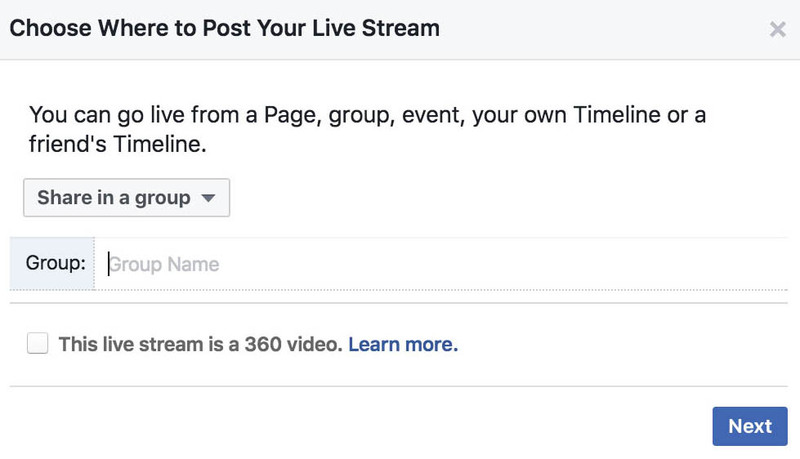 You’ll select where you’d like to share your Facebook live stream, most likely either your timeline or in a group. Next you’ll enter in the group name if streaming there and then you get to the screen that will look more like a post where you can write a blurb about the Facebook live stream, give the video a title and get your stream key to copy and paste into OBS. Within a few moments of pasting the key into OBS and selecting Start Streaming, your video will appear in the Facebook window and there you go, you’re now streaming live on Facebook. Now go do an awesome job of sharing your expertise! OBS is meant to do a lot more than I’ve shown so if you’d like to learn more about OBS, I highly recommend checking out Leslie Samuel’s Become A Blogger YouTube video series that goes in depth on the software. Are you ready to go pro on Facebook Live? If you’re interested in learning more about working with me, check out my services page.